Once you have tasted Dino’s homemade lasagna, you will never want to eat any other again. Made with mom Elaine’s recipe and a lot of love, Dino’s homemade lasagna layers cheeses, Valente’s Italian sausage, meat, Elaine T. Valente’s sauce and noodles into an unforgettable culinary experience or taste. Half-sheet pan, uncooked. $41.99. Serves 8-12. Half-sheet pan, cooked. $45.99. Serves 8-12. (2 days notice needed). Full-sheet pan, uncooked. $83.99. Serves 16-24. Full-sheet pan, cooked. $88.99. Serves 16-24. (2 days notice needed). Layered with Elaine T. Valente’s Homemade sauce, a rich blend of cheeses and a variety of seasonal vegetables. Contains no meat. Half-sheet pan, uncooked. $39.99. Serves 8-12. Half-sheet pan, cooked. $43.99. Serves 8-12. (2 days notice needed). Full-sheet pan, uncooked. $79.99. Serves 16-24. Full-sheet pan, cooked. $84.99. Serves 16-24. (2 days notice needed). To order Homemade Lasagna or to ask us about our catering options, please contact Valente’s at (303) 429-0590 or email info@valentesdeli.com. COME SEE US EVERY FRIDAY FOR THE LARRY SPECIAL! Served Friday Only From 11 AM - 3 PM! 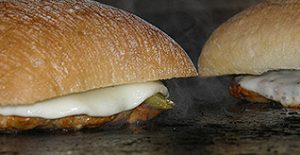 Valente's homemade Mild or Hot Italian sausage patty grilled and topped with melted provolone and grilled peppers served on a ciabatta roll with a side of Valente's homemade sauce, a bag of Boulder Chips and choice of Xing Tea, Boylan Soda, Valente's water or EverFresh Juice. The Best Homemade Italian Sausage in North Denver!